Anyone who has heard, yes the northern eastcoast had a lil earthquake measuring at 5.9. I cant believe we had an earthquake! I have only been in a small one before while visiting my grandparents in California when I was real young. My hubby and I were at the bank when I felt it. I thought that maybe I was dizzy because I was real hungry, but then I see everything swaying and it was just wild. Something totally out of the ordinary, like when there was a tornado in Brooklyn a few years ago. Its been a long time since Virginia Beach has had a quake. And I guess we are also gonna be having a hurricane too impact our area soon. Crazy. We even had the power go out for no reason a few days ago....very strange. My makeup today, just very natural with blue eyeline to make it pop and of course my usual colored eyebrows! well, last night I finished the memorial angel tattoo with the shading and a hint of color, but I am not sure I like the sunset rays in it. I may just redo that part. well, that was my day pretty much, with all the excitement and buzz of the earthquake, this girl is pooped! lol did I really just write pooped, well, you know what I mean, I am tired! Every moment that passes by is a moment that we will never get back. 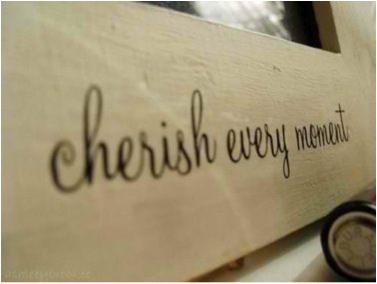 It should be a huge priority for everyone to cherish every moment that we possibly can. Make sure that you spend that time with your loved ones. Yes, it is important to work, but sometimes sacrifices must be made in order to just be there for the people that we love, and that know really need our support. Don't waste time in the pursuit of your dreams. They may seem out of reach at the moment, but the farther along that you progress, the less the distance will be to the finish line. Never stop, or let anything stop you from doing what you love, with the people that you love and that truly love you. Cherish every single moment in your life, because you never know when it will end, and because time is something that when spent, can never be recouped.